FLAGSTAFF, Ariz. - An international team of astronomers with the Trans-atlantic Exoplanet Survey announce today the discovery of TrES-4, a new extrasolar planet in the constellation of Hercules. The new planet was identified by astronomers looking for transiting planets - that is, planets that pass in front of their home star - using a network of small automated telescopes in Arizona, California, and the Canary Islands. 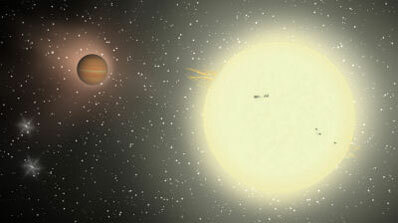 TrES-4 was discovered less than half a degree (about the size of the full Moon) from the team's third planet, TrES-3. "TrES-4 is the largest known exoplanet," said Georgi Mandushev, Lowell Observatory astronomer and the lead author of the paper announcing the discovery. "It is about 70 percent bigger than Jupiter, the Solar System's largest planet, but less massive, making it a planet of extremely low density. Its mean density is only about 0.2 grams per cubic centimeter, or about the density of balsa wood! And because of the planet's relatively weak pull on its upper atmosphere, some of the atmosphere probably escapes in a comet-like tail." The new planet TrES-4 was first noticed by Lowell Observatory's Planet Search Survey Telescope (PSST), set up and operated by Edward Dunham and Georgi Mandushev. The Sleuth telescope, maintained by David Charbonneau (CfA) and Francis O'Donovan (Caltech), at Caltech's Palomar Observatory also observed transits of TrES-4, confirming the initial detections. TrES-4 is about 1400 light years away and orbits its host star in three and a half days. Being only about 4.5 million miles from its home star, the planet is also very hot, about 1,600 Kelvin or 2,300 degrees Fahrenheit. "TrES-4 appears to be something of a theoretical problem," said Edward Dunham, Lowell Observatory Instrument Scientist. "It is larger relative to its mass than current models of superheated giant planets can presently explain. Problems are good, though, since we learn new things by solving them." "We continue to be surprised by how relatively large these giant planets can be," adds Francis O'Donovan, a graduate student in astronomy at the California Institute of Technology who operates one of the TrES telescopes. " But if we can explain the sizes of these bloated planets in their harsh environments, it may help us understand better our own Solar System planets and their formation." By definition, a transiting planet passes directly between the Earth and the star, blocking some of the star's light and causing a slight drop in its brightness. To look for transits, the small telescopes are automated to take wide-field timed exposures of the clear skies on as many nights as possible. When observations are completed for a particular field - usually over an approximate two-month period - astronomers measure very precisely the light from every star in the field in order to detect the possible signature of a transiting planet. "TrES-4 blocks off about one percent of the light of the star as it passes in front of it," said Mandushev. "With our telescopes and observing techniques, we can measure this tiny drop in the star's brightness and deduce the presence of a planet there." Not only is the planet TrES-4 mysterious and intriguing, but so is its host star cataloged as GSC 02620-00648. Georgi Mandushev explains: "The host star of TrES-4 appears to be about the same age as our Sun, but because it is more massive, it has evolved much faster. It has become what astronomers call a 'subgiant', or a star that has exhausted all of its hydrogen fuel in the core and is on its way of becoming a 'red giant', a huge, cool red star like Arcturus or Aldebaran." In order to help confirm they had found a planet, G�sp�r Bakos of the Hungarian Automated Telescope Network (HATNet) and Harvard's Guillermo Torres switched from the 10-centimeter TrES telescopes to one of the 10-meter telescopes at the W. M. Keck Observatory on the summit of Mauna Kea, Hawaii. Using this giant telescope, they confirmed that the TrES team had indeed found a new planet. In order to measure accurately the size and other properties of TrES-4, astronomers also made follow up observations with bigger telescopes at Lowell Observatory and Fred L. Whipple Observatory in Arizona. The authors of the paper "TrES-4: A Transiting Hot Jupiter of Very Low Density", accepted for publication in the Astrophysical Journal, are: Georgi Mandushev and Edward Dunham of Lowell Observatory; Francis T. O'Donovan and Lynne Hillenbrand of the California Institute of Technology; David Charbonneau, Guillermo Torres, David Latham, G�sp�r Bakos, Alessandro Sozzetti, and Jos� Fern�ndez of the Harvard-Smithsonian Center for Astrophysics; Mark Everett and Gilbert Esquerdo of the Planetary Science Institute; Markus Rabus and Juan Belmonte of Instituto de Astrof�sica de Canarias in Tenerife, Spain; and Timothy Brown of the Las Cumbres Observatory Global Telescope. This research is funded by NASA through the Origins of Solar Systems Program. Lowell Observatory is a private, non-profit research institution founded in 1894 by Percival Lowell. The Observatory has been the site of many important findings including the discovery of the large recessional velocities (redshift) of galaxies by Vesto Slipher in 1912-1914 (a result that led ultimately to the realization the universe is expanding), and the discovery of Pluto by Clyde Tombaugh in 1930. Today, Lowell's 19 astronomers use ground-based telescopes around the world, telescopes in space, and NASA planetary spacecraft to conduct research in diverse areas of astronomy and planetary science. The Observatory welcomes 70,000 visitors each year to its Mars Hill campus in Flagstaff, Arizona for a variety of tours, telescope viewing, and special programs. Lowell Observatory currently has four research telescopes at its Anderson Mesa dark sky site east of Flagstaff, and is building a 4-meter class research telescope, the Discovery Channel Telescope, in partnership with Discovery Communications.